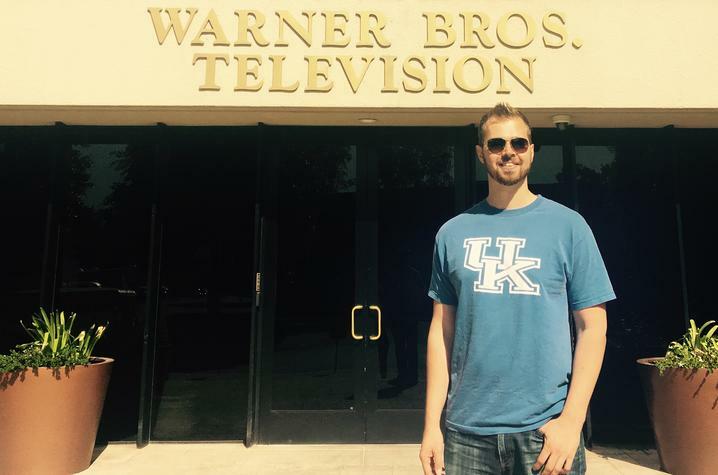 Luke Reedy, a 2013 UK alumnus, works in post-production for Warner Bros.
LEXINGTON, Ky. (March 8, 2018) — After graduating from the University of Kentucky in 2013, Luke Reedy took a chance to follow his dreams. He moved to Los Angeles without a job and knew only two people in the area. Today, he works for Warner Bros. as a post-production coordinator. "During my senior year, I applied to hundreds of jobs in LA and never received a response … someone told me the only way to get a job in LA is to move there," said Reedy, who earned a media arts and studies degree from the College of Communication and Information. "So I found a place, packed up my car and headed west." After two months working at a country club while job searching, he landed his first gig in the television industry. He went on to work on the shows "Claws" and "Rizzoli & Isles," both on TNT, as well as the pilot for "Training Day," a show that aired on CBS, and "ESPN Sport Science," among others. He's met Ben Affleck and Jay Leno and worked with numerous stars, but he was most excited to work with Dean Norris and Bill Paxton. "Working in post you get to be a part of the entire process… You get to see what the script becomes." His latest work was managing the post-production office for ABC's new show "Deception," starring Jack Cutmore-Scott as superstar magician Cameron Black who joins forces with the FBI. Reedy worked with actors and agents to schedule automated dialogue replacement, which improves audio quality or changes dialogue; ensured production cuts were delivered on time; and helped the production crew in preparing dailies (the raw, unedited footage from the day's shoot). This weekend, he'll be watching his hard work on the small screen as "Deception" premieres at 10 p.m. (9 p.m. Central) Sunday, March 11. "When the show airs we have already memorized every minor detail of the episode," he said. "It's always nice to see how people react to it." Once Reedy and the team deliver the episodes, they have about a week to wrap up the office, and then it's time for a break. "We work long hours so it's good to take a break after you finish a show," he said. What's next? Possibly another show, possibly working on the next season of "Deception," depending on if the show gets picked up and when. In the long run, Reedy aims to become a co-producer.